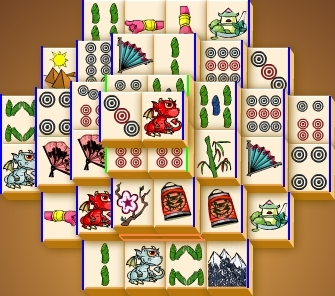 Kou-Jong is a easy to play (but difficult to master) puzzle game based on the modern spin-off of the ancient Chinese game, Mah-Jong (or Mah Jong, Mahjong, Mahjongg, and many other spellings). I could go forever about the history of Mah-Jong, but that wouldn't do anyone much good as to the game play. So if you've ever played Mah-Jong, you're good to go. To play, click on matching tiles. Very simple. Removable tiles have no other tiles on top of them and at least one side free. The blue lines show tiles that can be removed, the lime green lines show tiles that are visible, but cannot be removed beacuse there are tiles on top of them, the orange box shows tiles that are totally covered and unreachable, and all of the other tiles are unreachable due to tiles on both sides of them. The most of the same type you will get per level is four, or two pairs. Flower and season tiles are the only sets that are not exactly alike. Any one of each set can be paired with any of the other three. There are three levels of difficulty. Easy, medium, and hard. Each on has three different tile sets (more commonly known as layouts) that you play in order, each with more tiles than the last. The different settings have more tiles the harder the level you chose. Sometimes it will get to where there are no legal moves you can make. The game will tell you when this happens after you click on a tile. When that happens, click the reset button. You level score will be reset, but the total score from previous levels will stay. You also get a set number of hints for each level, 1 for easy, 2 for medium, and 3 for hard. Click the hint button and it will highlight two tiles that can be removed. If there are no more moves, it will say so. And then we have the bonus. It starts with 60 for easy, 180 for medium, and 360 for hard. and goes down one each second. When you finish a set, you will get points equal to the number left on there along with the level score based on the number of tiles in the set. The best way to go is to get rid of tiles on the top first, namely the ones with a lot of other tiles under them. This helps bring more tiles into play. Often the one thing that decides if you can finish the set or if you will run out of pairs is a choice between getting rid of a tile near the bottom and one on a stack or getting rid of two tiles near the bottom. If you can't seem to find any other pairs, click on a free one. If the game doesn't tell you that you're out of matches, start at one of the corners (any one, makes no difference which), and check each free tile for a match. If you still can't find one or just don't want to take the time to look, then use a hint. Also, to get an extra hint type cyodrake at any point of the game. Since you're free to retry a level even after you fail it, without losing any points from previous levels you've completed, going for a specific higher score in this game is fairly simple, if time consuming. Playing with the difficulty set to hard will give you exactly 144 level points per stage (432 in total). All that remains is to figure out the number of bonus points you need to reach your goal. For example, if you're aiming for a score of 800, you'll need an average of 123 bonus points per stage. Of course, the later levels will take longer, and hence will be tougher to earn bonus points on, so you could, for example, aim for 160 bonus points on stage 1, 120 on stage 2, and 90 on stage 3. With your targets set, all that remains is to play and attain the required bonuses. While you're playing, keep an eye on the number of bonus points remaining - if it drops below your target, you'll have to hit reset and start the stage again. Since you keep points from any previous stages you've managed to complete, you'll be able to keep retrying each stage for as many times as you need (for example, if you manage 163 bonus points on stage 1 for a total of 307, those 307 points will not be lost, even when you have to reset stage 2). Kou-Jong is an addicting little game that anyone will love, and gives a nice Neopian twist to an old game (plus I get paid neopoints for playing one of my favorite games now). It's also very easy to understand and play, so remember the tips from here, and you'll be able to play Kou-Jong (and any version of Mah-Jong) with ease.